David and Patricia Howard were "the heart and soul of the family"
Police are urging drivers on the M6 to take care as they drive pass the scene of a lorry fire in Cumbria. Two lanes are closed on the Northbound carriageway between J36 and J37. The closures are expected to remain into the morning rush hour. Please slow down and take care when passing, follow diversions in place & allow extra time for your journey this morning. 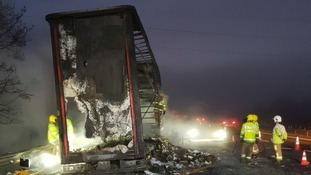 Highways England and the police are working to recover the vehicle and clean up fine debris left after the fire. People are being asked to leave extra time for their journeys after a lorry fire on the M6. One lane is closed in the Southbound direction between J33 (Lancaster South / Garstang) and J32 M55 ( Broughton Interchange). The M6 is closed in both directions after overhead power cables came down on the carriageway. It's between J17 and J18 - with traffic queueing back towards Crewe. Traffic officers are attending. People are being asked to exit the motorway at J18 Southbound, and J17 Northbound, following diversion signs. Traffic is being held on the M6 Southbound after two lorries crashed near Crewe. It happened just before J16, and please say is causing tailbacks all the way back to J17 for Sandbach. Traffic officers are now on scene and organising recovery for the lorries involved. The M6 is currently closed in both directions following a collision with a HGV which has hit the central reservation. The crash happened at 11.58am on the southbound carriageway between junctions 20, Lymm interchange, and 19, Knutsford. A quantity of fuel has split onto the road and as a result the carriageway is closed in both directions. There are no reports of any injuries. Local diversions are in place and motorists are advised to avoid the area. At this stage we do not know how long it will be closed for, but will update when possible. England's 112 motorway services have been ranked from best to worst in a new survey by Transport Focus. The Thelwall Viaduct near Lymm has been completely shut southbound as emergency services work to put out the blaze. Witnesses say traffic is back up for miles because of the fire between J21 at Woolston and J20 the Lymm Interchange.Police are urging motorists to avoid the area and find alternative routes if possible warning of long delays. Anyone stuck in the congestion is asked to stay in their vehicles while the incident is ongoing. We have pedestrians leaving their vehicles and walking toward the scene,please don't this is not SAFE. Vehicles stuck in the traffic M6 sb at J21 are not to turn and go against the flow of traffic, we have further fire engines making. Police have now confirmed that one lane has been opened to relieve traffic.